From leading her team onto the Optus stadium turf to play Collingwood in front of a record-breaking crowd for women’s football of almost 42,000 fans in February, to her April engagement to fellow athlete, Ebony Antonio, Donnellan has had a phenomenal year by anyone’s standard. When the ecstatic couple shared the news of Donnellan’s proposal on Instagram, fiancée Antonio posted “could 2018 get any better?” Donnellan’s acceptance of Swan Districts’ Head Coach offer is proof that sky’s the limit for Australia’s favourite power couple. 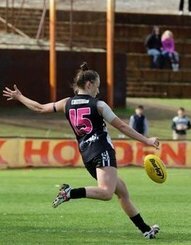 “I have had a number of conversations with the Club’s CEO and Football Manager post 2018 WAWFL season about my thoughts on coaching the club next year,” said Donnellan. “I have also had a number of conversions with my partner, current and ex-players and club staff, and after weighing up all my other commitments outside of football, I decided that this is where my passion lies, in helping those around me and to give back to our great game. I am extremally loyal to this incredible football club and feel like I owe a lot too. I want to give back to the club that has given me so much both on and off the field,” Donnellan said. Donnellan’s understanding of the organisation’s ethos, which extends beyond just a football-centric focus and prioritises building community and developing people, is reflected in her goal formulation. “My short-term goals as League Coach is to continue to develop my coaching and be the best coach I can be. 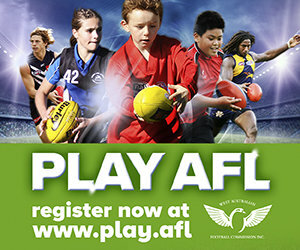 To learn off the coaches and players around me across both the male and female programs, to continue working with the football club and football department to align both the male and female programs and to continue imparting the club’s values to the players, staff and volunteers to ensure we are continuing to build a strong football community and enhance wellbeing amongst members of the Swans’ community. I want to help develop our players so they succeed at the current level and provide them with the resources and knowledge that will enable their advancement so they can excel at the next,” shared Donnellan. My long-term goals include achieving success both on and off the field, to provide opportunities, knowledge and skills to players that will facilitate their growth whatever pathway they choose, whether it be at AFLW or State based level. I want to continue growing Swan Districts as the premier pathway club and the leader in developing players and the people of the Swans’ community. I want to help grow our State based league in Western Australia and bridge the gap between other state-based competitions across the country, so we are recognised a competitive state in all levels of our game. As a player I play to win premierships, as a coach that doesn’t change - I want to win premierships and win games and continue the rich history of this club,” Donnellan stated vehemently. In addition to the hefty goals, Donnellan has set herself, she also has her sights set on establishing a new program. “I want to help grow a semi-professional program that bridges the gap between our state-based program and the next level at AFLW. This starts from off-field processes, recourses, access and structures to on-field development. I want to impart what I have learnt over my last three years in an AFLW system and help bump up the standards of our state league programs. I have a game plan that will complement the players at the football club, is easy to understand, and will be exciting brand of football to play and watch,” Donnellan divulged. “We’re delighted to have someone of the calibre and profile of Kara lead our women’s football teams,” said Swans’ CEO, Jeff Dennis. “I love the culture and the rich history of our great football club, I love the supporters, the loyalty and our fearless reputation – what we stand for and how other clubs see us. We are a strong pathways club that is all about developing people and community,” Donnellan said passionately. With 2019 fast approaching, both the staff and supporters of Swan Districts’ women’s teams are eagerly counting down the days until the start of the new football season. With 100% confidence in Donnellan’s coaching ability, the fans are anticipating another fantastic year of female football under her helm.